The story of the prophet Elijah and the Widow of Zarephath, and her son, begins after Elijah was being fed by ravens at the brook Cherith. The brook dried up and God sent him to Zarephath. This is a time of famine and the faith of the widow of Zarephath is being tested. Should she feed herself and her son or believe that if she feeds the prophet Elijah first she will have plenty to eat. 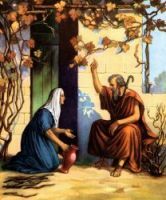 This is another story of faith with Elijah and the widow. 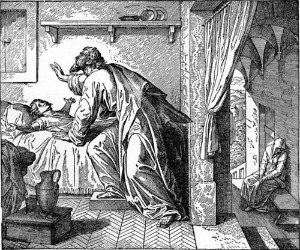 The widow's son becomes sick and dies and Elijah calls on God to revive him.